I grew up in Carlsbad, New Mexico. I recently moved to Henderson, NC after 24 years in Mt. Vernon, IL. I am married to wife Julie. We have four children and four grandchildren. I am a graduate of New Mexico State University with a degee in Chemical Engineering. I spent forty-one years with Continental Tire before retiring in 2009. I was corporate manager of environmental programs for North and South America when I retired. I have always had an interest in the arts. I have experience in oil painting and stained glass. Julie and I are active in numerous community theater groups where we perform onstage and assist backstage. I have done a commercial for digital television for WSIU. Julie and I can be seen in the documentary "The Legend of Charlie Birger" produced by WSIU. 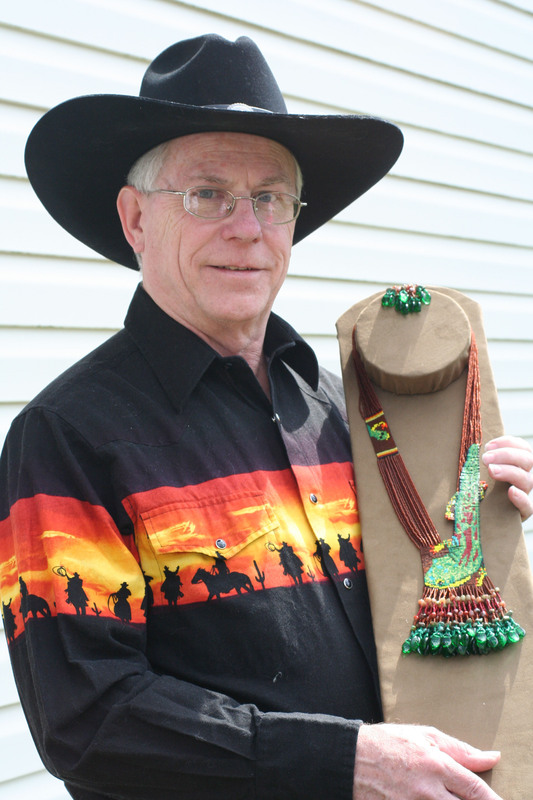 I enjoy showing my beadwork at Native American Art Shows. Since we have recently relocated to North Carolina, I am not aware of what art shows are in this area. If you know of any, please send me an e-mail so I can start participating in shows in this area. I am open to anything within a four hours drive. Having grown up in the Southwest, and being a member of the Choctaw Nation of Oklahoma, I have an appreciation for Native American design. My father was a "rockhound" and taught me an appreciation for mineral gemstones. On all of my Native American theme splitloom pieces I try to use mineral gemstone beads in the necklace fringe to compliment the design. I have recently been doing more "back stitch" or bead embroidery using the mineral gemstones. I usually let the stone guide me as to the design of the piece. I recently completed a special order of beaded rosette medallions featuring turtle designs for "The Indian Drum" located on the Arnold Dock on Mackinac Island, Michigan. If you are on the island, stop in and let them know you saw my plug on my website. In 2002 we were in Carlsbad and visited the Carlsbad Art Association shop. 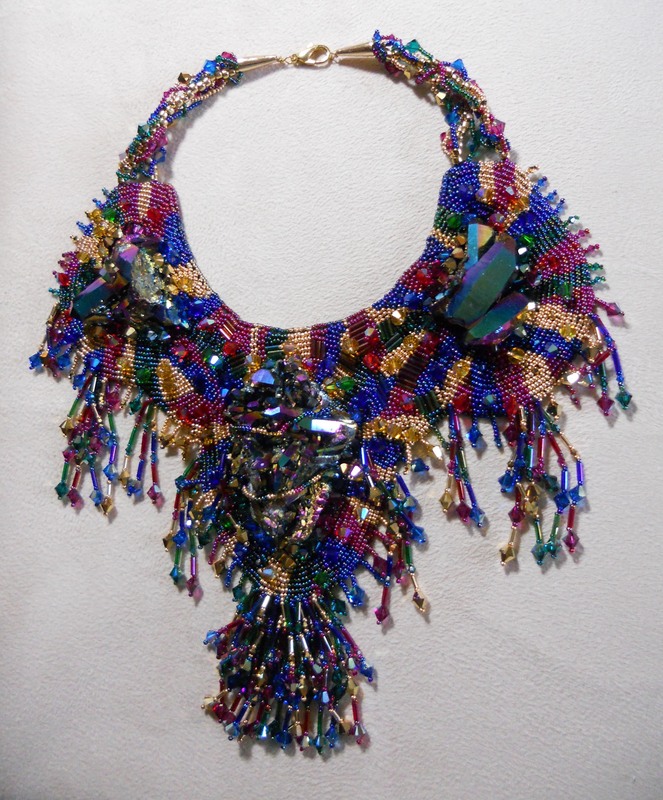 There was a selection of splitloom necklaces by Freida Bates for sale. We bought one. With the necklace came a brochure about Freida and a reference to her website. After reading about her beadwork, I wanted to learn how to do loom beading. I sent her an e-mail and she replied recommending two books; "Out on a Loom" by Margie Deeb and "Beading on a Loom" by Don Pierce. With these two books, I began the most enjoyable business of my life. In the Fall of 2013 I had the pleasure of meeting Frieda for the first time, face-to-face. Seeing her actual beadwork which has appeared in books and websites was amazing. And, I learned there are no rules. If you can think it, you can bead it. The Mother Lode. This necklace is made using titanium oxide crystals as focal stones. It is bead embroidered with #11 seed beads and is enhanced with swarovski crystals in the design and in the fringe.